What Is a BAE Automated Drop shipping Business? BAE is apply drop shipping business model which you can use to run your online honey & organic business without ever holding any inventory. Once you’ve made a sale our crews will ship your honey products from our warehouse, straight to your customer’s doorstep. You’ll never need to worry about storing, packaging, or shipping your products. How Does the BAE business operating Work? There are three major players in the dropshipping business model: the honey supplier(Borneo Acacia), the distributor (you) and the customer. Borneo Acacia’s playing a role of supplier in a dropshipping business model which includes creating products, carrying inventory, shipping products to customers on behalf of the distributor, replacing defective products, and restocking products. We sell honey products to the distributor at wholesale prices assuming the risk of unsold inventory. In the BAE dropshipping business model, the distributor, you, sell the borneo acacia’s honey products on your own website under your own brand. You’ll be responsible for choosing and marketing those products. Plus, you’ll also be responsible for managing customer inquiries and complaints. 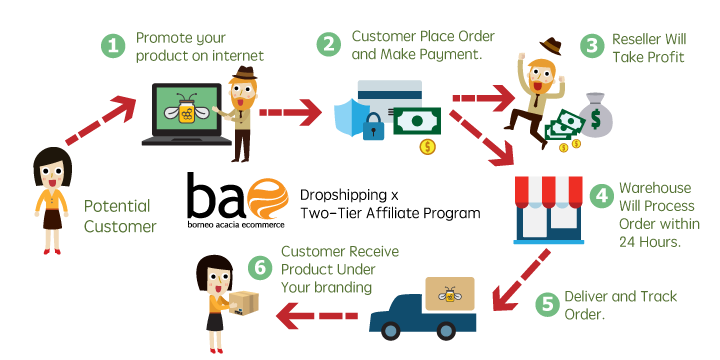 Lastly, in the dropshipping business model, the customer buys the products directly from you the distributor . If questions or issues arise, they contact the distributor they bought the product from.